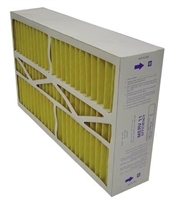 While many households find a basic allergy filter sufficient, we recommend you try a home air filters that traps smaller particles if you continually suffer from indoor allergies. 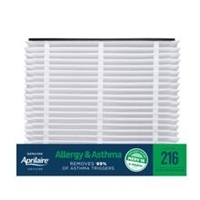 Advanced air filters are ideal for those with allergies because they are designed to capture more particles at smaller sizes, including dust, pollen and pet dander. These air filters even trap fine particles from tobacco and cooking smoke. 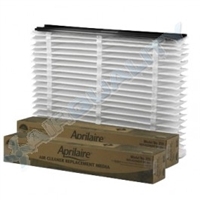 Because advanced filters are capable of trapping bacteria, mold spores and fungi, they also offer protection against illnesses. 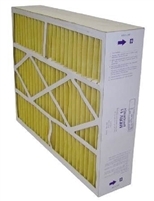 Breathe easier with a quality allergy filter. Please note that some older systems will not be capable of handling these filters. Most newer systems manufactured within the last decade will. If you have any questions about whether your system can handle it send us an email or call. 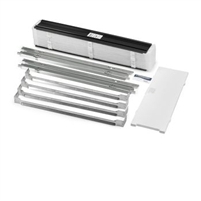 You will notice a slight decrease in your air velocity upon installing these filters. Exact Size: 19.875" x 24.75" x 4.375"
Nominal Expanded Size: 20" x 25" x 4"
Exact Collapsed Size: 26" x 4"
Nominal Expanded Size: 16" x 27" x 4"
Exact Collapsed Size: 28" x 4"